A 9 hole golf course called Leigh Park Golf Club was in existence and situated at Belfairs Farm during the 1914-18 war. 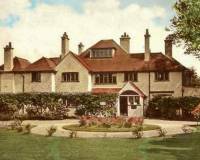 The original clubhouse is still in existence and situated near the present 4th tee at Belfairs Golf Course. In 1919, Southend Borough Council made a compulsory purchase of the Belfairs Estate, the Council wishing to promote sport in the town and so created Belfairs Park with an 18 hole golf course, football and cricket pitches, bowling greens and a trotting track. The renowned course architect Harry Colt (designer of Royal Troon, Wentworth, Woodhall Spa and Chelmsford) was contracted to redesign the course, extending it into the woodlands and blasting away trees as he did. On Saturday, 11th September 1926, Mayor Alderman Dowsett officially opened the Belfairs Park Golf Course making it the first municipal course in Essex. A fourball exhibition match followed between Harry Crook (Belfairs GC pro), James Braid (5 times Open champion), JB Batley (Thorpe Hall GC pro) and JH Taylor (5 times Open champion). Belfairs Golf Club was formed in July 1926 with 46 members consisting of former members of Leigh Park Golf Club and other members of the public. The first captain was Mr Reginald Southgate Brown.